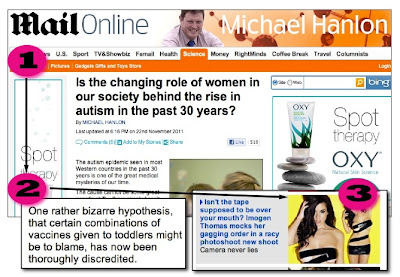 The Daily Mail finally lapped itself in the crazy race today. No 1: It linked growing autism rates to the rise in prominence for women in the work place and successful parents. No 2: It then went on only four pars in to describe the belief that it was down to MMR, a story it had been the lead cheerleader for, for many years as a 'rather bizarre hypothesis'. No 3: It, however, added the coupe de grace, which shows just how far the women's movement really has to go to achieve its goals, by publishing pictures of glamour model Imogen Thomas (famed for sleeping with a footballer) posing in duct tape to protest at a 'gag on her telling her story. It was irony, but only on a base level that a moron may consider advanced. As I said, it lapped itself in the crazy race, but only as Jonathan Swift furiously spun in his grave at St Patrick's Cathedral in Dublin.